1. 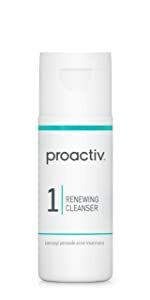 Proactiv Renewing Cleanser – Proactiv Acne Treatment. Gentle yet effective, the Renewing Cleanser is formulated with tiny, smooth exfoliating beads to sweep away dirt, oil, and makeup – plus prescription-grade benzoyl peroxide to fight acne-causing bacteria. 2. Revitalizing Toner – Proactiv Acne Treatment. 3. Repairing Treatment – Proactiv Acne Treatment. Benzoyl peroxide penetrates quickly to attack acne at its source, clearing blemishes and helping to prevent new breakouts from forming.